World View & Market Commentary. Focused on Real & Knowable facts that filter through the "experts" fluff and media hyperbole. Where we've been, what the future may hold and developing a better way forward. "Logic is the "mechanics" of thought and of analysis, the process of identifying fallacious arguments and statements and so systematically removing contradictions, thereby producing factual knowledge that can be trusted." - On Logic as found in Plato's dialogues regarding the teaching of the Trivium. Many market pundits claim to analyze market FUNDAMENTALS. But the vast majority of professional market analysts are simply talking their own book, they are divorced from reality. Those who are afraid to examine reality are removed from it. For the sake of your money, your family, your nation, please don’t let that be you! Please, please take the time to learn about how our nation, our money, and our markets actually work… this is relevant to why I am supportive of the Cryptocurrency revolution. We cannot truly examine markets unless we’re willing to understand the forces acting upon them. So much so, that once a person does understand reality, then they will come to understand that ALL traditional markets today are owned, controlled, and manipulated by the same people. How did this happen? It happened because our elected representatives to Congress in the year 1913 illegally and unconstitutionally gave away the largest and most important power they, and the people had. It was THE MOST IMPORTANT CHECK AND BALANCE IN THE CONSTITUTION. That is the power to coin money and to regulate the value thereof! Once that power is given to private individuals, then they produce endless quantities of money to BUY ALL THE BRANCHES OF GOVERNMENT, THUS SUBVERTING THE ENTIRE CONSTITUTION, AND OWNING THE ENTIRE GOVERNMENT. NOWHERE in the Constitution does it allow Congress to simply give away their responsibility to private individuals! Thus it was illegal and improper of them to do that. I sincerely think that every law passed since the fake “Federal Reserve Act” should be in question due to the fact that our lawmakers have been compromised. Since that time, their interests have not been our nation’s interests. Because of this, we don’t really have an elected government working on behalf of the people (Donald Trump may be the first exception to this since JFK, and there is a historic WAR occurring between his team and the Deep State right now). Our money (the debt Dollar) is not real and not even legal, not because it’s not backed by gold, but because of WHO is behind it! What’s most important about money is WHO, NOT WHAT! And so now our government is FAKE, our markets are FAKE, our statistics are FAKE, our media is FAKE, our wars are FAKE, our “intelligence” is FAKE, our pursuit of “Security” is FAKE, our entire judicial system is FAKE, our science is FAKE, our medicine is FAKE, and I could go on. It’s a tough reality to swallow, and it even goes much deeper than that. This is so difficult for most people to accept, that they live in a totally FALSE NARRATIVE – intentionally deceptive, intentionally meant to program our thinking, to distort our sense of reality. I recently ran across the following video interview of Kevin Shipp. Mr. Shipp is Ex-CIA. He is a well-spoken truth-teller who not only spells out who, what, and how big the Deep State is, but he is rare in that he understands the money connection and how it is the root of the problem. I HIGHLY ENCOURAGE you to watch all the following interviews – it will take some time, so please come back and view them as you can – THEY ARE REALITY that simply cannot and should not be ignored. This reality impacts YOU, it impacts your family, it impacts the markets, and it impacts your wealth. It will make you angry. Understanding this reality is necessary, and it is the place to start, to understand how and why reality in a vast number of other subjects has also been distorted. Part 3 asks for a $2.99 rental fee – I encourage everyone to support truth tellers like Mr. Shipp. *A personal experience note: I was an Air Force officer and pilot for 15 years. It was the AVIP (anthrax program) that opened my eyes to how money, politics, and the deep state work. I left the Air Force and abandoned any retirement from my service due to this. This program was a FOR REAL CONSPIRACY. These sociopaths did not and do not give a rip about anyone. It was Mueller and Comey who “investigated” 9/11 and the anthrax that was mailed around our nation. I can tell you that the dissemination of actual anthrax was 100% a CIA operation! It was tied not only to 9/11, but also it was tied to Bioport, Inc. of Lansing, Michigan, who were the makers of the Anthrax vaccine. "He sat on the boards of Texaco, Merrill Lynch, Pfizer, Norfolk Southern Corporation, and General Dynamics. He also served on the board of Emergent BioSolutions(then Bioport), a company that provided controversial anthrax vaccinations to the U.S. military in the 1990s. The deal was approved by the Clinton administration, with which Crowe had a previous relationship. 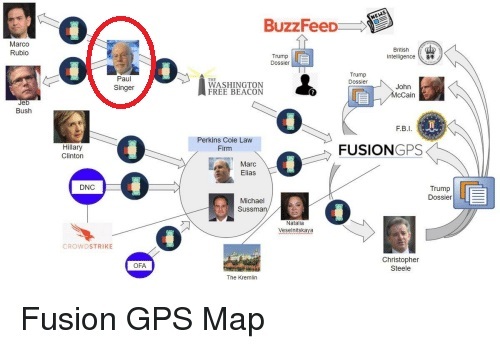 At the time of his death, Crowe served as the chairman of the board of Global Options, Inc., an international risk-management and business solutions company headquartered in Washington, D.C."
This is DEEP STATE. This is how they operate. There were brochures made to justify these vaccines, and they were 100% lies – easy to uncover lies. Many people fought this program and the FDA shut Bioport down as many lawsuits were filed. The REALITY IS THIS: Not only does the Deep State kill innocent people to get what they want, the markets are 100% FAKE and controlled by the same string pullers. This is reality – it is not pleasant, but once you know this reality, then you will understand that the “markets” are moved to achieve their objectives. In other words, when the oligarchs get what they want, everything goes up. When they aren’t getting what they want, then they use markets as a weapon against those who oppose them. Reality? You bet. When you dive into “mainstream” markets, you are diving into this morass. This is exactly why I no longer participate or support anything mainstream, especially their markets. The rise of Cryptos is a direct result of this, and it is what will ultimately reverse this. But we need every soul to stand up – our collective conscious needs your awareness and support. For those that missed it, an off road motorcycle crash left me with 3 vertebral compression fractures along with 3 broken ribs in my back. That accident occurred February 1st, so it’s been almost 3 weeks now. Tough is how I describe my recovery so far. The first order of business is to prevent the fractures from getting worse. That means having any stress off my back. Yet laying down horizontal in almost any fashion is very uncomfortable – and that has resulted in very limited sleep. That limited sleep is translating into difficulty writing, so please be patient as I recover. I am paying attention to the markets and other events, so as I have the energy I’ll get my thoughts out to you. There are major forces at work right now, and major market turning points approaching in nearly all markets; Those that are REAL (Cryptos), those that are underlying real but highly manipulated (gold, silver, oil, other commodities), and those that are 100% FAKE AND MANIPULATED (Stocks, Bonds, Government Statistics, Derivatives of all types, etc). Well, news flash for Mr. Singer: It is YOU who runs one of the biggest scams in human history – namely the hedge fund named Elliott Management. Your wealth, power, and control are derived from trading in 100% fake financial instruments that not only make a pig blush in its relative brilliance, but your profession and trade are predicated upon the emptiest of all negative value instruments in the history of humanity, the debt DOLLAR. Bitcoin is not the fraud, it is by far THE MOST VALUABLE form of money ever invented! How so? It is the first form of “money” that is NOT centralized by “decree of the King.” It is the FIRST money to break the MONOPOLY on what money is! That means, Mr. Singer, that YOU DON’T CONTROL IT! And that terrifies you and all ilk like you. And you should be terrified! Because the base where you derive your power and control is crumbling – YOUR MONOPOLY IS OVER. The FUD that you propagate is simply not believable, no more than the fake dossier and narrative you helped to promulgate. The fake “markets” manipulated by people like you ARE OF NO CONSEQUENCE to REAL PEOPLE any longer. I, for one, could care less about those fake markets, I only pay attention at this point to keep track of your criminality. Good Riddance, Mr. Singer – Hell, and hopefully prison will see you soon. As I pointed out in my last update, Bitcoin produced a historic buy signal, and has been climbing ever since. First it broke the 200dma, then the descending wedge, now it’s breaking what would be the upper boundary of a descending channel, and next it will break the 100dma on its way to getting over the $13,800 resistance level. Litecoin is the best looking chart of all the Cryptos right now. It is obvious that money is flowing into both BTC and LTC, while most of the Alt-Coins are not in cycle remaining mostly flat for now. 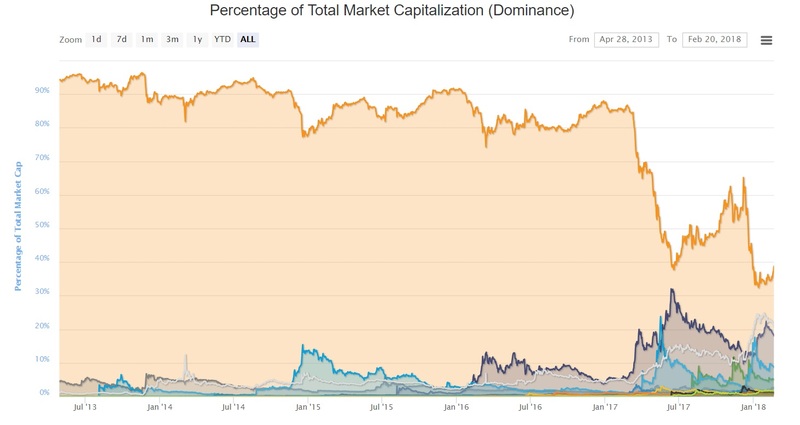 Remember that BTC leads, all the others follow. That was a really fast 25% gain. I still think we reach the Trillion dollar mark somewhere mid-year. Despite my loathing of fake people like Mr. Singer, I will be doing a big picture market update for all the major FAKE markets soon. In that update I will point out what to watch for as the central controllers continue to destroy the value of the debt dollar, and how to know if they are manipulating another debt deflation cycle (and why), or if the end-game for the current version of the debt dollar (still more inflation) has arrived. Until then, stay real, stay decentralized, and may Karma catch up quickly to those that promulgate FUD. Litecoin Cash – Scam or Legit?? For those who aren’t yet aware, there is a Litecoin fork (first ever) that’s supposed to occur on the 18th or 19th of this month, just a few days away. Supposedly you can receive 10 Litecoin Cash (LCC) for each LTC you possess at the time of the fork. This has caused much speculation and has people scrambling to buy LTC prior to the fork. As you can see on that chart, the downtrend has clearly been broken to the upside, it is a very bullish chart. Note how similarly to BTC, LTC touched the 200 day moving average and has bounced producing a new buy signal on the daily MACD. But is LCC a scam or is it legit? Since on the topic of scams, any fork of Litecoin, calling itself Litecoin something or other, is a scam IMO. 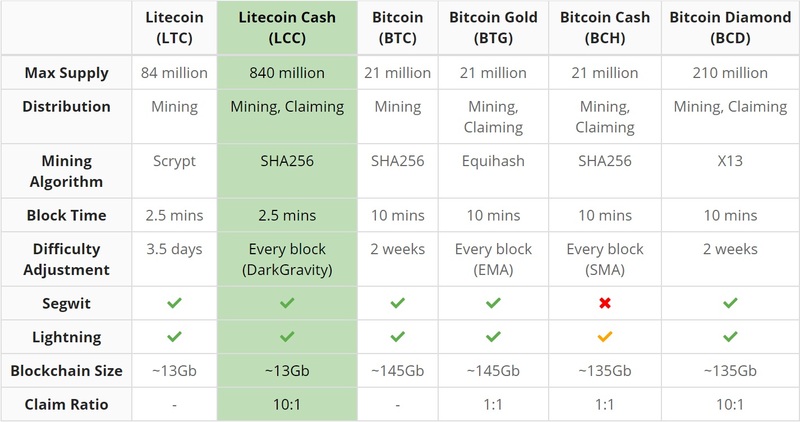 Litecoin Cash, Litecoin Plus, Litecoin *... all scams trying to confuse users into thinking they are Litecoin. This also applies to all Bitcoin forks trying to confuse. Clearly, Charlie believes it to be a scam. In fact, he like many others, believe people doing these forks and using the Litecoin or Bitcoin names are inherently weak for trying to piggyback on the name and not doing their own coding and marketing. I agree with this philosophically. Most forks piggyback not only on the name, but they use the open source Bitcoin code – in fact that’s exactly what Charlie Lee did, he copied the BTC code, made a few changes, changed the name, and has made millions off it. Okay, that’s the way open source is, and the BTC source code is far and away the most proven and secure. Now, when I go to the LCC official website, I find that they list many benefits, including the fact that old BTC mining software will be able to mine LCC. Their website is respectful and seems to be looking after people’s interest with their “safe fork” discussion. However, there is no whitepaper and the team is very young and thin with only 4 members. Note that Charlie Lee says not to give them your LTC keys in order to claim your LCASH. I would agree, at least at a minimum I would wait to see if in fact people are successfully claiming them, and that an LCASH wallet actually materializes. One thing is for certain, with Charlie Lee at Coinbase, don’t expect Coinbase to distribute LCC to your account automatically! Thus if you wish to claim your LCC, you must ensure that you have your LTC in your possession, inside your own LTC wallet off any exchange (I use Trezor). Then move the LTC to another wallet or an exchange, then use the old and now empty wallet keys to claim your LCC. So, I do think there is a high probability that this is a scam, at a minimum it is a fast and loose copy/modification of the LTC/BTC source code. That said, I do have my LTC off exchange and will be able to claim my LCC once proven. I will wait and watch before attempting to claim my LCC tokens. If I am successful, I will immediately sell them since there is no whitepaper, and since the “team” looks to be profiting with minimal effort on their part. Then I’ll use the proceeds of that sale to purchase LTC. Boy am I a fan! My hope is that this year Segregated Witness and the Lightning Network will radically change the speed and cost of transacting with Bitcoin. But wait, there’s more… Lightning also can accommodate cross-block transactions. This is HUGE, a game changer, because it means that we’ll be able to trade one another different coins directly with NO MIDDLEMEN. This, and other technologies like Atomic trading and Plasma, mean that days are numbered for exchanges (except to get dollars if required, they are certainly not desired). Right now lighting is running in a test mode with test nodes. A node is simply the entire ledger that resides on your computer so that as transactions occur the ledger that exists on your computer can be compared and verified by other ledgers on other computers to verify transactions. The more nodes, the more robust, and the more decentralized the network is. Once verified, hopefully later this year, Lightning will release a final version of their node software that likely will include incentives for people running a full Lightning node. I currently run a full Bitcoin node on my computer and will also run a Lightning node when it is released. I’ll write more about running your own node later, it’s certainly easy to do and actually doesn’t require any expertise and very little energy and bandwidth – I don’t even notice my computer is running it. Wave B... What a Wonderful World! Central Banker One World, Your Worst Nightmare! Military Spending – Obama, you promised change! The Dawn’s Early Light… Calling all PEOPLE to get us through the night! Separate Corporations and Their Money from State! Did the Year 2000 Mark the Debt Saturation Point? Signs of Bubbles... "Betting on the Markets"
Carbon Derivatives to Become World’s Largest Derivatives Market? Employment Situation in Chart Form – Damn, I knew I should have moved to New York and found a job on Wall Street! The Week in Charts – Buckle the Heck Up! WE ARE AMERICANS - WE STAND STRONG AND WE STAND FREE! - Is it Time to Turn Out the Lights? - Financial Panics = Political Change! - Why Models Are Our Only Hope? - But They Can’t Do That! - Is Fortuna Going to Change Course for Obama? - The Irrational Free Markets that are Never Wrong?/ Why Taxes are the Only Tool Remaining! - Will the DOW Reach 30,000 by 2015? - Will Gold Reach $5,000+? - Japan & It's Future After the LDP! - Deflation or Inflation - Which is More Likely? - A Three Year Old With a Pocket Calculator can Figure Out We are Screwed! - The New Yorker - "The Secret Cycle…"
- Is America On The Verge Of Another Bank War? - Behind the Curtain, The Full Monty! - Can the Euro Survive a Sovereign Debt Crisis? Hannity Promises To Expose CNN & NBC News In "EpicFail"
Economic News , Data & Views....October 18 , 2017.....Topics To Consider today-1) Markets : Asia- Economic Calendar For Asia - Thursday , Market Moving Data & News ; US - More Record Closes For US Stocks , Earning Reports From Ebay , Alcoa , American Express , Kinder Morgan & UAL ; Additional Items Of Note. 2) US Political News - Puerto Rico Updates ; DC Swampland News ( Tax Reform , Healthcare , Various Russia Related Investigations ) ; Additional Political Items Of Note To Consider. 3) Spain - Hours Away Potentially From Article 155 Being Imposed , Spain Awaits The Reply Of Catalan Gov't President Regarding Independence Declaration - Cat & Mouse Game Continues. 4) EU-UK Talks - Today's "Back & Forth" Between PM May & EU Leadership. 5) Ukraine - Protests Increasing As Restless Citizens Take To The Streets Again , Second Maidan On The Way Perhaps , Additional Items On Ukraine. 6) Odds & Ends - From Across The Globe. Mish Moved Off Blogger to MishTalk.Com - For Email Alerts Please Sign Up Again on MishTalk! 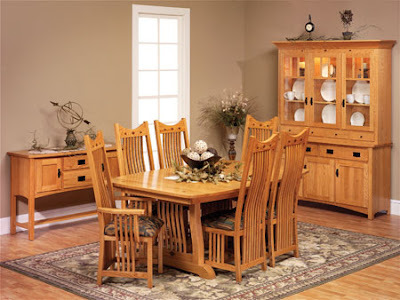 Beautiful handcrafted Amish furniture. Tell Jake that Nate sent you and receive 5% off your wholesale order price! This feature compiles and sends new posts for the day, but only once each day, it does not send updates in real time.